I'd rather show you how to make these truffles. They are really not difficult to make. 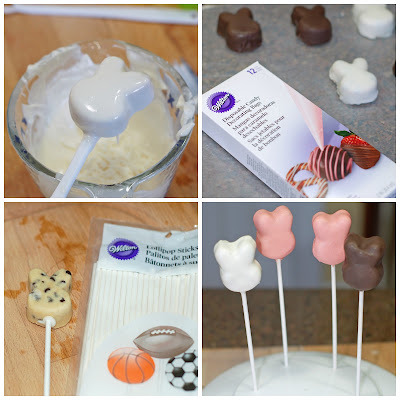 If you can make a cake pop, then you can make these. The cookie dough recipe is from the My Little Cupcake Pop Blog. You can find it here. I did use the suggestions to add less brown sugar and as my egg replacer, I used Wilton's Meringue Powder, 2 tsp. Meringue powder + 2 Tbsp. Water = 1 Egg White. The consistency of the dough is perfect for molding and the taste..well, let's just say you may be a few bunnies short in the end after multiple quality control tastings. The last time I made these truffles I used the My Little Cupcake POP heart shaped mold for Valentine's Day. This time I wanted to do an Easter theme and I came across this Wilton's silicone treat mold. It looked like it could work. I dusted the mold with some flour, then dump out the excess. And filled the cavities with the cookie dough. I pressed down, so the cookie dough would be compact and removed any excess dough so that the it was flush with the mold. Then I popped the mold in the freezer for a half hour. Next I gently turned the mold over and pressed out the bunny truffles. It worked like a charm. Then I put them in an airtight container and returned them to the freezer. To dip and decorate, I used Wilton's pink, white, and dark chocolate candy melt; black decorating icing; and Wilton's candy dipping tools. Just dip, swirl, pull out, and tap off the excess candy melt, then place on wax paper until it sets. It does take some practice, but you have 24 tries to get it right. Actually, I ended up with 30 bunny truffles from this recipe. Note: You do want to keep them in the freezer until you are ready to dip them in the candy melt. I found that they didn't break apart that way. I made some as just truffles, but if you are adventurous you can make bunny pops. 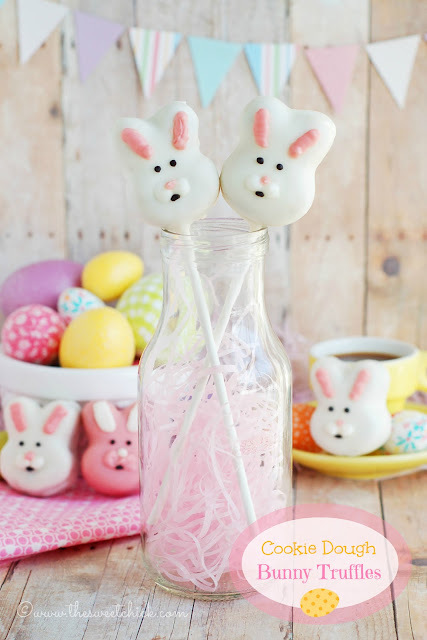 Just dip a lollipop stick in candy melt, then insert it into the bottom of the bunny shape and let harden. Then dip and decorate. I used Wilton's Disposable Candy decorating bags to add the candy melt cheeks and the insides of the ear. I squeezed some of the black icing into one of the bags to pipe the eyes and mouth. I found all my Wilton products at the craft store, Joann's or Micheals. 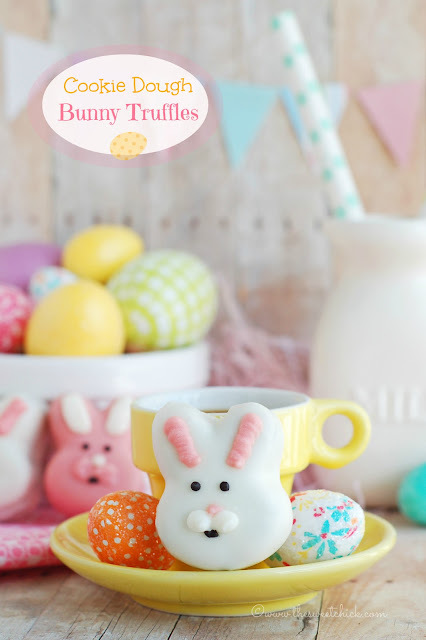 So hop on over and get your stuff today to make these cute little treats in time for Easter. You can make the bunny shaped dough ahead of time and keep them in the freezer until you are ready to decorate them. Also, once finished, you can keep them in the fridge or in an airtight container since there is no real egg involved. Definitely skip that kind of fun this year!!! Those cookie dough bunnies are too cute! I really do need to get to Joanns and find some fun Easter stuff before it's too late!!! I always want to buy everything at Joann's. I have to control myself every time I go. Great job and thanks so much for partying with us at Time to Sparkle! These look wonderful! Extra virgin coconut oil, organic, might be a good choice to try. Can’t wait to try these! You are sweet as always Joy! These are so cute! I love that they are made out of cookie dough. These are adorable! Such a fun treat to make for the kids. Pinned. I stopped by from Weekend Potluck to check out your post because I'm hosting an Easter/Passover Recipe Roundup and would just love it if you would "hop" over and share this awesome, yummy recipe. I would also like to invite you to share your talents on my new link party The Yuck Stops Here. Both can be found on Hot Momma’s Kitchen Chaos at http://mommasangelbaby.com. I hope to see you there! HUGS & Happy Easter! PS - I hope the stomach bug passes you by too! Thanks for stopping by Cheryl. I am hopping over now. Thanks so much for linking up! Hope to see more great things from you! Glad you liked them Shel.